Traveller's Tales: Of Breakfasts, Quick Lunches & the Wii! For some reason, the concept of eating breakfast outside your home hasn't caught on in India yet. In the US, it's pretty common to see people eating out or picking up food on their way to work. The only ones you see at places that open early for breakfast in India are students and retired people. Also, Indian breakfast places are almost always idlis, dosas, and vadas. Therefore it is not surprising that even McDonald's doesn't have a breakfast menu in India. The last two days were busy and full of meetings held in different locations within the Bay Area. 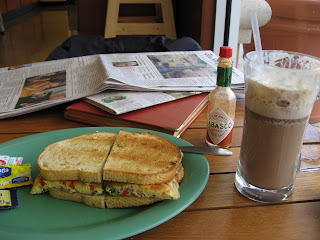 On days like this, I start with a good breakfast, so I can skip lunch if schedules are very tight. Park Place at the Cypress offers good breakfast options, but I prefer walking down to Le Boulanger which is right next door. I highly recommend the Vegetable Medley omtette on sliced sour dough. 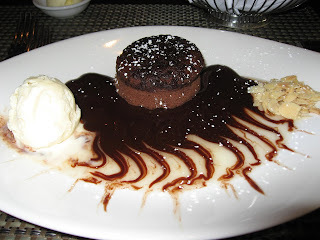 After a quick meeting in San Francisco downtown yesterday, I popped into The Flytrap but only ordered a dessert. Also, when I was passing the Virgin superstore I happened to notice a small note that said "Wii available today" and rushed in to see if that could be true (they are sold out everywhere, even on Amazon). The store had apparently recieved eight of them the evening before and were already down to two. 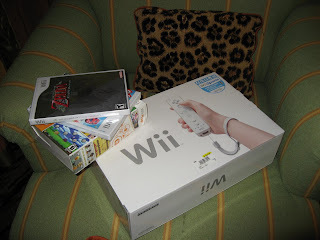 Now I am a proud owner of a Wii bundle! @beelee: Yes, this surprises most outsiders. @backpakker: I seem to enjoy breakfasts everywhere: the idli/vadas in India, the eggs/sausages in the West, and even the soup/dimsum kinds in the Far East.